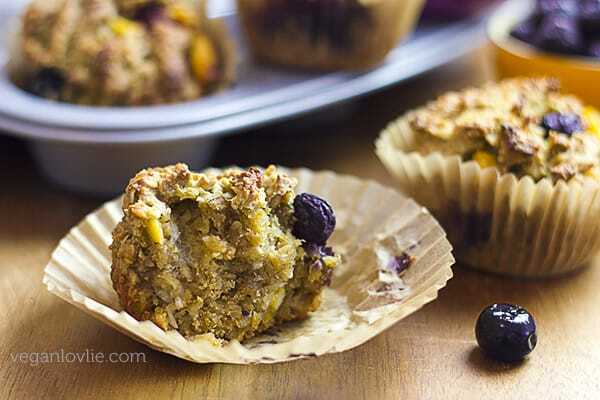 Simple gluten-free oatmeal muffins that are packed with mango and blueberry for a bold twist on the classic blueberry muffins. These sugar-free muffins get their natural sweetness from the mango puree used in the batter and the juicy chunks of fruits. 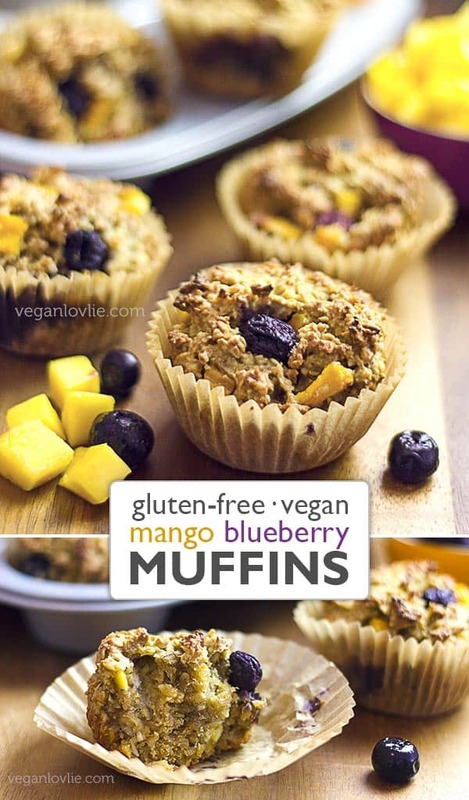 Enjoy as vegan breakfast muffins or a healthy snack; they are also low on the glycemic index and suitable as a diabetic dessert. Of all the things that I miss from being away from my home country, the mango and coconut trees that grow (till today) in the garden at my parents house are among the vivid memories I have of home. Nothing can compare to the succulent yellow flesh of these plump mangoes. Sun-ripen on the tree, they deliver the most exquisite floral aroma for an out-of-this-world experience. These trees were planted when my parents moved into their new home. It took about 5 years for the mango trees to reach maturity to bear fruits. Back in the days, kids would often climb up these trees and enjoy eating their mango while sitting on a branch with their feet swaying in the air. They would dig their teeth into the soft skin and peel it off while all the juices would smear their faces, hands and clothes into a whole mess. Once they had eaten all the mango, kids being kids, they would throw the pit at passers-by and hide in the trees, as they were being yelled at. Ah, the simplicity and satisfaction of eating a mango in this way! I was already too old, alas, to be climbing up trees and having a blast eating mangoes up in the branches. I had almost completed high school and by the time the trees started yielding fruits, it was time for me to pursue my studies abroad. So, I only had the chance to savour these juicy drupes for about 2 harvests, before I left the country. Tropical fruits like these, that are bursting with flavour, would most of the time be eaten as is. Any surpluses were not preserved or introduced into cooked recipes but rather given away to neighbours and friends. Back then, it never occurred to me to use them in baked goods even though I did bake quite a lot with apples, oranges and pears. But ripe mangoes were always treasured and eaten raw. At most, the green ones were made into pickles or salads. Around this time of the year in Canada, mangoes are the sweetest, even though the store-bought half-ripen ones are a little less alluring than the fully mature tree-ripen ones. Nevertheless, for my love of tropical fruits, I do pack my basket with an abundance of them to my heart’s content. As it turns out, very often, they ripen all too fast — faster than I can eat them. So, while adding to their nutritious benefits, a healthy muffin recipe is all that is needed to hold these exotic chunks of flesh and make them last for a few more days. 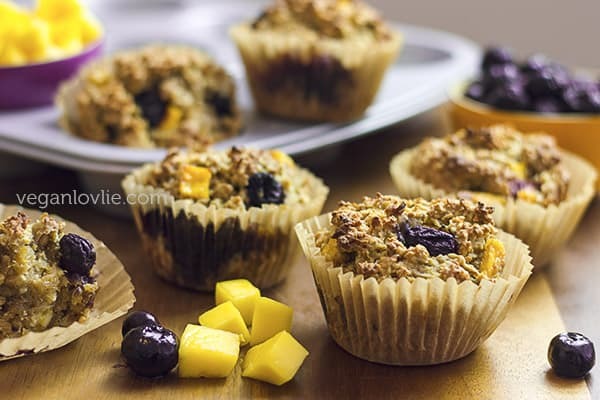 Added to these oatmeal muffins, that are also free of gluten and refined sugar, are moist blueberries for another layer of unique flavour combination. The mango, however, undoubtedly take the centre stage and add a bold twist to the classic blueberry muffin. And while we are taking a tropical stance here, coconut flakes not only lend a rich sweet nutty aroma but also improve the texture for the promise of a tasty gluten-free sugar-free treat. Perfect as breakfast muffins on a chilly wintry morning or as a healthy snack, these simple muffins can be made even healthier if using coconut oil instead of vegetable oil. The fruits provide enough natural sweetness in these wholesome yet hearty muffins. I feel even the maple syrup could be left out if you are looking to make it more suitable as a diabetic dessert or foods that are low on the GI (glycemic index). You could actually very well turn this easy muffin recipe into banana oatmeal muffins by swapping the mango for very ripe sweet bananas (around 3 bananas should make up for the amount of puree needed). If opting for banana, this recipe also works as a gluten-free banana bread too. Just make sure you are using a small loaf pan (20 x 10 cm or 8 x 4 inches). The arrowroot powder acts as a binder in this recipe. Unlike some other starches like tapioca, it does not lose its thickening properties (to act as a binder) in an acidic environment (i.e. 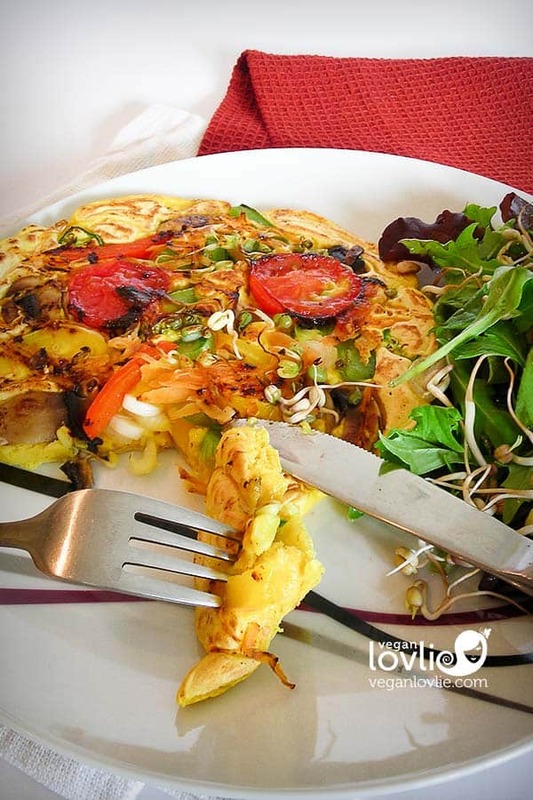 with apple cider vinegar and the slight acidity of the mango puree in the batter). If you want to substitute it with another starch (like cornstarch, tapioca or potato starch), you may need to add in half a banana as well (then reduce the amount of mango puree) or else add in one flax egg (i.e. 1 tablespoon ground flaxseeds + 3 tablespoons water, leave to stand until it becomes like a thick jelly). Both Kevin and I are allergic to flax seeds; hence arrowroot works well for us. Watch the recipe video for the easy step-by-step process. I also show you how to peel and cut the mango. Preheat the oven at 200 degrees Celsius (400 degrees Fahrenheit). 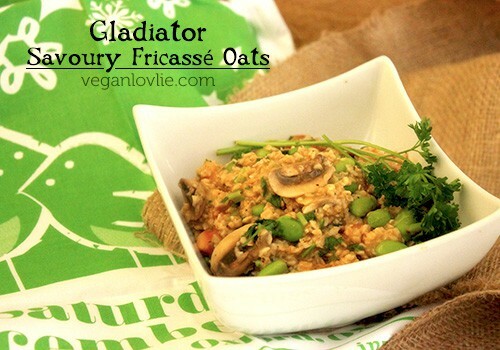 Place 1 cup of the rolled oats in a blender and process to a flour. Add the oat flour to a large mixing bowl. Add in the rest of the rolled oats along with all the dry ingredients. Mix all the dry ingredients together, then make a well in the centre. Keep aside. Peel the mango and cut into chunks. Cut about 1/4 cup of the chunks into smaller pieces and set aside. Place the rest of the mango chunks in the blender and process to a puree. This should yield 2/3 cup [165 ml] of puree. If not, make it up to 2/3 cup by adding a little water or non-dairy milk. Pour the puree into the well in the bowl of dry ingredients. Add in the rest of the wet ingredients. Mix everything together. Once flour is moistened, add in the reserved mango chunks and the berries. Line 6 cups of a muffin tray with muffin liners. Drop the mixture using a spoon into each cup. You can fill them up to the top as these muffins won’t rise by a lot. Place in the oven and bake for 15 minutes then reduce the temperature to 180 degrees Celsius (350 degrees Fahrenheit) and bake for another 12 – 15 minutes (total 27 – 30 minutes). Take the muffins out of the oven and test if they are done by inserting a toothpick in the middle. If the toothpick comes out clean, the muffins are done. Remove them for the muffin tray and allow to cool before serving. Note: The batter mixture is somewhat on the dry side. Don’t worry about this as when it bakes, the fruits are going to release more moisture for an optimum texture. A simple gluten-free oatmeal muffin that is easy to make. 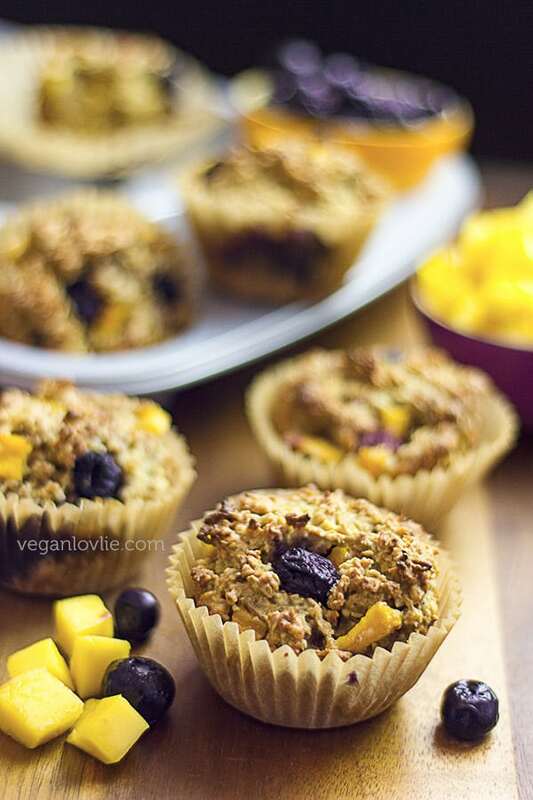 With mango, blueberries and coconut, these muffins don't really need any additional sugar. These muffins are perfect for breakfast or a snack. Place the rest of the mango chunks in the blender and process to a puree. This should yield 2/3 cup of puree. If not, make it up to 2/3 cup by adding a little water or non-dairy milk. Line 6 cups of a muffin tray with muffin liners. Drop the mixture using a spoon into each cup. You can fill them up to the top as these muffins won't rise by a lot. Place in the oven and bake for 15 minutes then reduce the temperature to 180 degrees Celsius (350 degrees Fahrenheit) and bake for another 12 - 15 minutes (total 27 - 30 minutes). Take the muffins out of the oven and test if they are done by inserting a toothpick in the middle. If the toothpick comes out clean, the muffins are done. The arrowroot powder acts as a binder. Unlike some other starches like tapioca, it does not lose its thickening properties (to act as a binder) in an acidic environment (i.e. 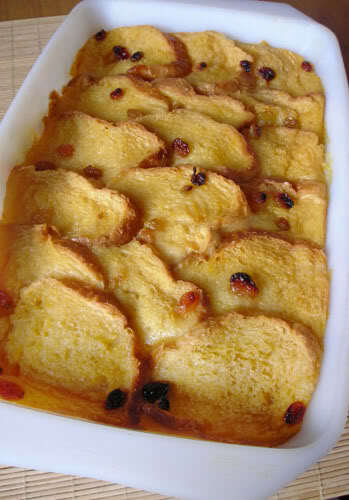 with apple cider vinegar and the slight acidity of the mango puree in the batter). If you want to substitute it with another starch, you may need to add in half a banana (then reduce the amount of mango puree) or else add in one flax egg (i.e. 1 tablespoon ground flax seeds + 3 tablespoons water, leave to stand until it becomes like a thick jelly). The batter mixture is somewhat on the dry side. Don't worry about this as when it bakes, the fruits are going to release more moisture for an optimum texture. These are the best muffins I’ve EVER had. SOOOO GOOOOOD! These were so delicious!!! Truly a very hearty muffin with delightful fruity-ness! I have a bit of a sweet tooth so to make mine a bit sweeter(also to make up for the fact that I could only find frozen mangos that were not too sweet) I added some soaked dates. They came out so tender and all my family can enjoy them since these are gluten free. Thank you so much for the wonderful recipe! You never fail to post the best. Wow just now I finish making the Oats mango blue berry muffins. It came perfect. Thanks. Yay! Glad you enjoyed the recipe Ruwani.